My answer is "Some of the above". I do infrequently check my credit report.. usually check my financial statements.. do shred stuff.. and limit my credit cards.. I also have Identity Theft insurance. How would you answer this poll? 2,3 & 4. 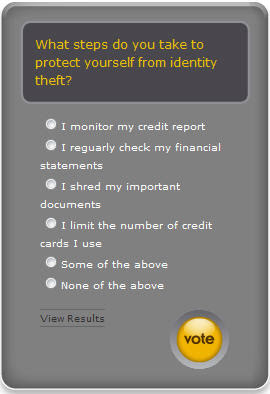 Even though limiting the number of credit cards (for me) has nothing to do with identity theft. I just use the ones that give me cash back. Wow ... see what I mean. I should read stuff before I post. Lifelock. If Brian dies I"ll never be able to access our accounts. I got identity thefted over ten years ago. I was lucky, because the idiot used her picture on an ID and it clearly wasn't me, so I was able to clear it up without huge incident. I had a credit card number stolen from the bank's records three years ago, and that was quite the hassle to clear up. I limit the number of cards (to one), shred papers, don't buy on-line except from huge obvious vendors, keep good spyware detectors on my computer and have the bank check my credit records when I do other business with them.